Cuemacro has an array of data products. Over Saeed Amen’s career, he has created a large number of data indices, including Nomura’s growth surprise and terms of trade indices. He was also part of the team which developed Lehman Brothers MarQCuS FX tradable FX index product, which had 2bn USD AUM. Utilising Saeed Amen’s deep expertise in this field, we offer our own data indices for clients. In time we are hoping to add more. Cuemacro’s proprietary macro data indices seek to use both conventional and unusual datasets to give market participants a better understanding of the prevailing macro environment. Below we present our various macro data indices. 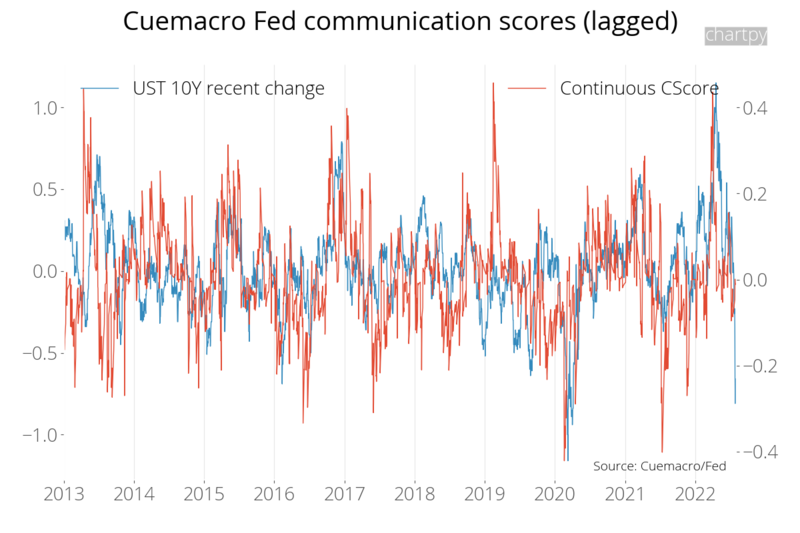 Applying natural language processing to FOMC statements, we create a proprietary score for Fed hawkish/dovish sentiment. Below we have the index lagged by a month. For further details about subscribing to the raw data and getting live data, please contact Cuemacro. Using factors including news data, we apply a proprietary algorithm to generate a daily forecast for the upcoming change in US non-farm payrolls release, using a multitude of different underlying input data. More macro data indices to come soon! Live positions and returns statistics are available for this for members. For further details please contact Cuemacro.